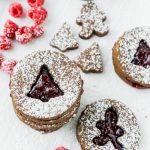 These chocolate raspberry Linzer cookies are the perfect addition to any plate of Christmas cookies! They're simple to make, full of rich decadent dark chocolate flavor, and even have a hidden healthy bonus! Add sugars to butter and beat until combined. Add Vital Proteins collagen peptides and cocoa powder then mix until combine. Beat in vanilla extract, raspberry extract, and egg. Add salt and flour. Beat until dough begins to form. Remove dough and place in a plastic bag (or in plastic wrap) and let chill for at least 2 hours. If dough is too hard when you take it out of the fridge, microwave for 10-15 seconds or until pliable, making sure not to microwave it too long. Roll out dough until about 1 inch thick. Cut out cookies using a 3 inch circle cookie cutter and place on a cookie sheet with either parchment paper or a non-stick silpat sheet. Before baking, use the mini cookie cutters to cut a shape out from half of the circle cookies you cut out previously. It's easier to do this once they're on the cookie sheet than to try and move them once cut out. Bake cookies for 10-12 minutes or until cooked through but the bottoms are not burnt. Do not cook for more than 12 minutes as cookies will harden a bit while cooling. Move cookies from baking sheet to a cooling rack to cool. Once cookies are completely cooled, place a spoonful of jam on the bottom side of one cookie (without the shape cut out) and spread around, almost all the way to the edges. Carefully top jam with one of the cookies with the shape cut out, so the jam fills into the mini shape. Continue with all of the cookie sandwiches. Enjoy right away or store in an airtight container until ready to eat.